Assassin’s Creed Odyssey is one of the most customizable games the series has seen so far. This time around, not only can you pick who want to play as, but you can also equip them with various armor sets that change their outward appearance. But with so much choice, it can be tough to know what to stick with. Here’s how to search out the best armor in Assassin’s Creed Odyssey, along with tips for early, mid, and late game sets to pick up. 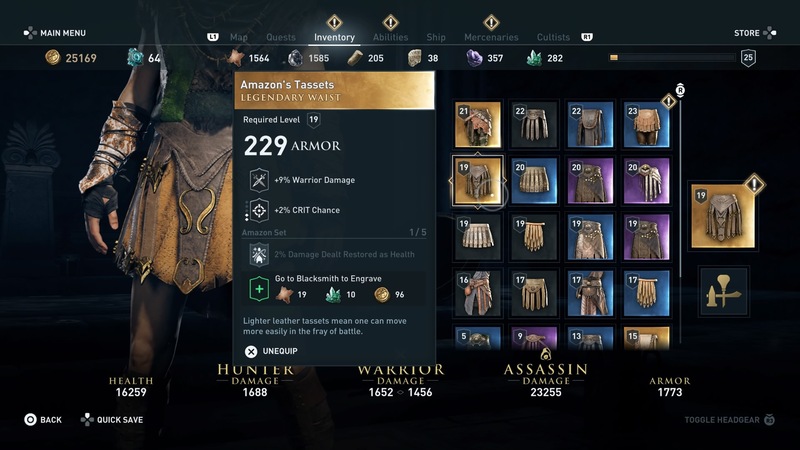 There are five main armor slots in Assassin’s Creed Odyssey: Head, Arms, Torso, Waist, and Legs. You can fill these slots with equipment of four different rarity levels, each with different types of special abilities. These range from Common items, which have a black background, to Rare, which have a blue background, to Epic, which are purple, to Legendary, which are golden. Each piece of armor has a base stat armor rating, as well as a stat bonus ability. Common items have one stat bonus, while Rare items have two bonuses. Epic items tend to have three bonuses, whereas Legendary items have two regular bonuses and one unique golden bonus if you wear all of the items from a particular set. Legendary and Epic items tend to have the highest base stats, then Rare and Common. If you’re not going to wear an entire set of Legendary armor, this can mean that Epic armor is actually better, because you get the full benefit of all three stat boosts. 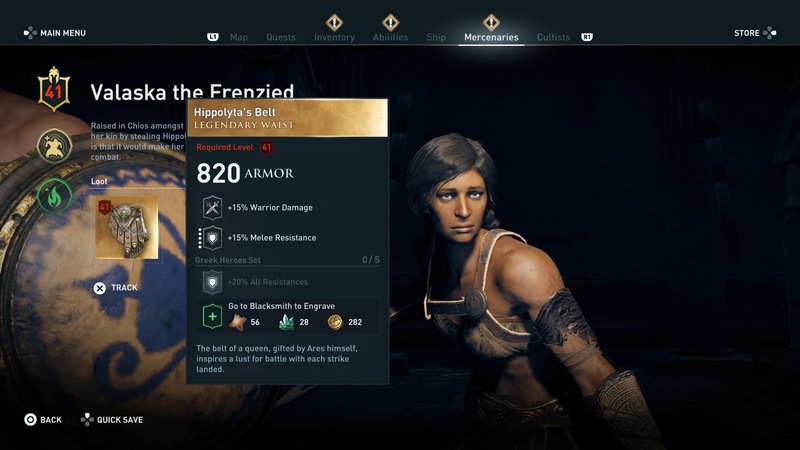 Engraving is one way of upgrading your items in Assassin’s Creed Odyssey. It allows you to add any of the stat boosts that you’ve unlocked to any other piece of equipment – increasing its power and utility. You unlock engravings by completing in-game challenges, such as killing 100 enemies with assassinations, or slaying 20 predator animals. Obtaining Legendary items also unlocks their Legendary engraving. Once unlocked, you can add engravings to equipment by visiting a Blacksmith. It costs resources and Drachmae to do, so make sure you’re engraving a piece of equipment you’ll get a lot of use out of. As soon as you start your journey in Kephallonia, you’ll get some meager equipment. It’ll soon outgrow its usefulness, so you’ll need to search out something better. The Mercenary Armor set is a good one to look out for because the torso, belt and arms are all Rare quality items, meaning they have better stats and give you more bonuses than comparably levelled Common Gear. 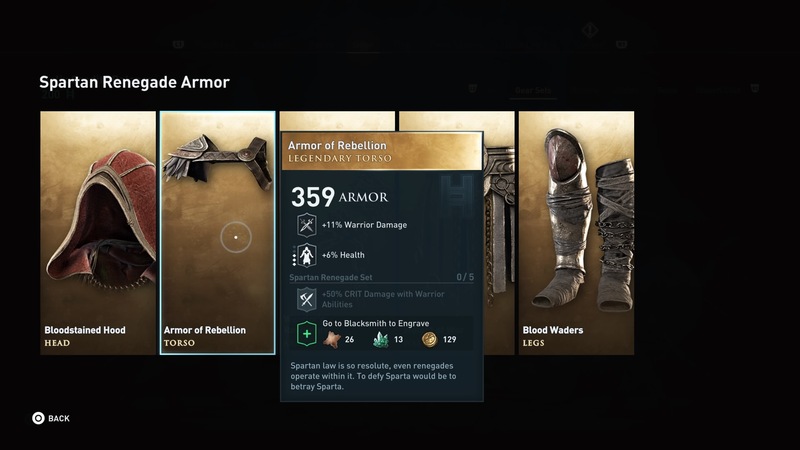 Either frustratingly or amazingly based on your perspective, there isn’t really any particularly great armor to recommend during the mid-game of Assassin’s Creed Odyssey. While you’re still leveling up, any armor that you come across will quickly get outclassed in terms of armor rating as you progress. 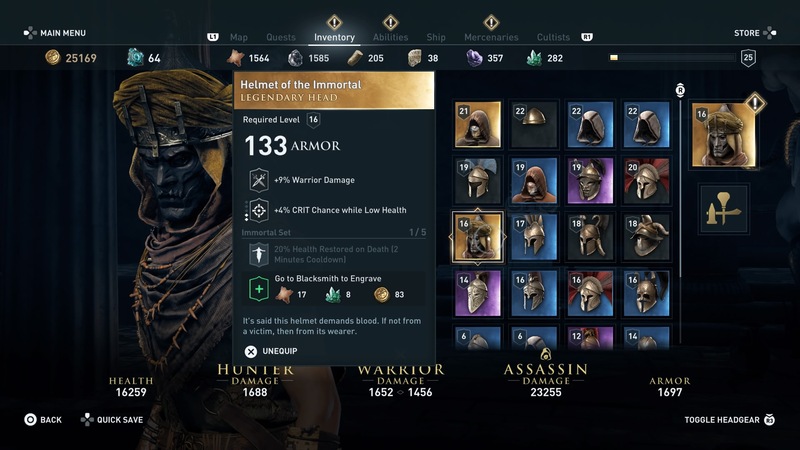 This means that the best armor for the mid-game of Assassin’s Creed Odyssey is usually the highest level gear that you have access to. Of course, it still makes sense to gravitate towards Epic and Legendary gear because they have the highest stats and best bonuses. Even they’ll become obsolete before long though, and it isn’t cost effective to keep upgrading them at the blacksmith either, because they’ll just feel weak in a few levels again. Late game armor is all about the bonuses, and there are a few Legendary armor sets that have exceptionally powerful abilities. First off, the Immortal set’s bonus of restoring 20% health on death is basically the same as the Second Wind ability – making it so you can spend a skill point elsewhere. Another great outfit to have is the Amazon set, which heals you for 2% of the damage you deal – which is awesome in boss fights where every sliver counts. Both of those sets are obtained by hunting down and killing Cultists of Kosmos. 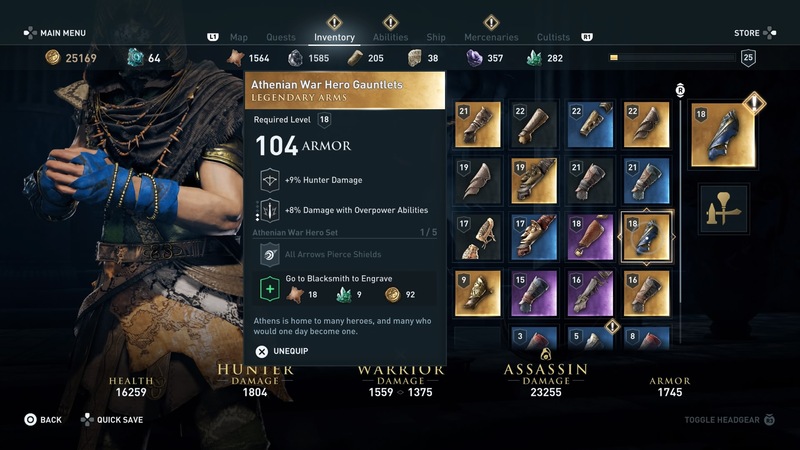 As for other useful armor sets you can find as random drops or from Mercenaries, the Greek Heroes set is a great one to have – since it gives you +20% to all resistances. Hippolyta’s Belt is an exceptionally good part of the set, since it give you another 15% melee resistance on top of that. Style points go to Jason’s Golden Fleece, the Legendary Torso that we found on Kallidora the Resplendent, another part of the set, and one of the coolest pieces in the game. If you’re a ranger, then the Athenian War Hero set is awesome. This makes it so every arrow you fire penetrates shields – invaluable against all of the protected foes you face throughout your journey. Melee players may also like to use the Spartan Renegade set, which gives you +50 damage on your Warrior Ability critical hits. This makes your Overpower Attacks still and absolute monster since it crits so much and for such high damage. One set that I initially underrated was the Pirate set, which grants +50% to damage from Assassin abilities. It seems like this includes Critical Assassination, which gives a great boost to your ability to take out tougher enemies quietly. Once you unlock the Engraving for any of these sets though, you can add it to anything you want – so mix and match! If you’re just starting out on your Assassin’s Creed Odyssey journey, check out our ultimate guide here.